When it was issued in 1856, it cost a penny. In 2014, this tiny square of faded red paper sold at Sotheby's for nearly $10 million, the largest amount ever paid for a postage stamp at auction. 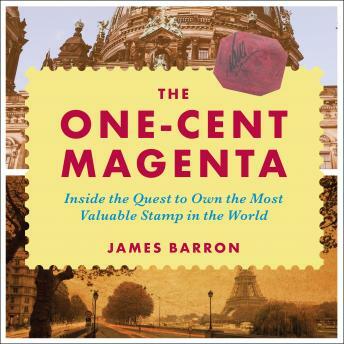 Through the stories of the eccentric characters who have bought, owned, and sold the One-Cent Magenta in the years in between, James Barron delivers a fascinating tale of global history and immense wealth, and of the human desire to collect. One-cent magentas were provisional stamps, printed quickly when a shipment of official stamps from London did not arrive in British Guiana. They were mostly thrown out with the newspapers; one stamp survived. The singular One-Cent Magenta has had nine owners since a twelve-year-old boy rediscovered it in 1873. He soon sold it for what would be $17 today. Among later owners was a wealthy French nobleman who hid the stamp from almost everyone; a businessman who traveled with the stamp in a briefcase handcuffed to his wrist; and John E. du Pont, who died while serving a thirty-year sentence for the murder of Olympic wrestler Dave Schultz. The One-Cent Magenta explores the intersection of obsessive pursuits and great affluence and asks why we want most what is most rare.